Is it more useful for you to know that you have woken up on a Tuesday or simply that it is July 10th? 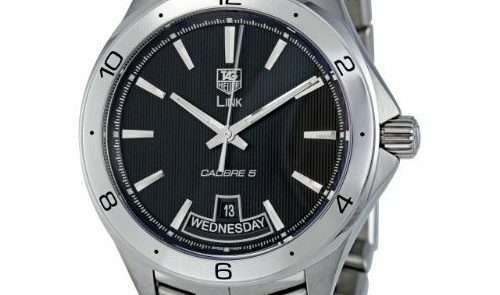 A distinguishing feature of this Tag Heuer Link is that it displays both the day of the week and the date…and it also boasts a rapid day and date correction feature. This would be a plus for those of us whose schedules are determined by specific weekday rather than simply a number. Further, like a number of other watches from Tag Heuer’s Link collection, the hour and minute hands on this timepiece are plated with silver-white rhodium—which is a non-corrosive precious metal. Rhodium is non-reflective, which helps if you are trying to read the time under bright light. With luminescent markers on its hands and indexes, this watch is also easy to read in the dark. This is particularly helpful, since the dial is black. To some, the black dial may appear a little austere against the finely brushed and polished stainless steel strap, but others will like its aura of understatement. For those who prefer a more uniform look, this watch is also available with a silver dial. Pros: As stainless steel is so durable, I would consider a stainless steel casing to be a pro. This watch’s scratch-resistant sapphire crystal is double anti-reflective and water-resistant to 100m (300 feet). Also, keep in mind that since this watch has a stainless steel strap it would actually be possible for you to swim while wearing it, too! Possible cons: This watch runs on an automatic movement, which is often of interest to the mechanically minded, but of less interest to people who simply want a watch that can be extremely reliable and extremely accurate for long stretches of time. An automatic movement means that this watch doesn’t require too much maintenance in terms of time-keeping but it will need to be re-set every once in a while. Some consumers may find this tedious. This watch claims a 38 hour power reserve, which some might consider to be a little on the low side. Typically a power reserve on an automatic watch will run somewhere between 42 and hours. Worth the price? 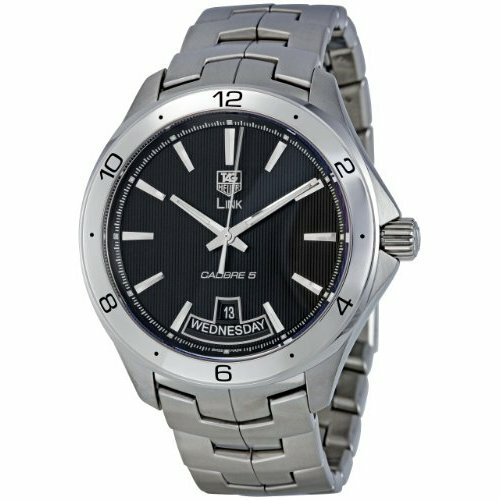 Anyone fond of the Tag Heuer brand would likely appreciate this attractive and versatile watch. If you are planning on buying it for a gift, just be sure that your giftee is used to (or appreciates) an automatic movement.